Sometimes homeowners overlook the outside of their home when they are considering decorating and lighting choices. It is important to choose the appropriate outdoor lighting in order to increase the curb appeal, value, and safety of your home. 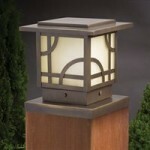 There are several different styles and varieties of outdoor light fixtures to choose from. No matter what kind of light fixture you are looking at, you can find it with either a traditional incandescent light bulb or with solar outdoor lighting. Solar lighting is quite popular because it does not use any electricity and you eliminate the hazards associated with electrical cords. Outdoor solar light fixtures are usually accompanied by a solar collecting panel so they are sometimes larger or have multiple pieces which can be cumbersome. No matter what type of light source you choose for your outdoor light fixtures, your home will be greatly improved with the addition of outdoor lighting. 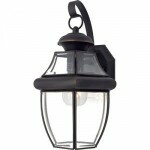 The first type of outdoor light fixture we will discuss is a sconce or outdoor wall light fixture. 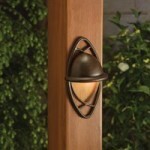 Outdoor sconces are light fixtures that are attached to the outside wall of your house. 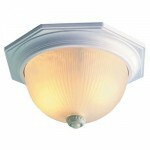 You will find outdoor light fixtures in the sconce style on porches and beside entryways most often. They are usually controlled by a switch inside the house. When deciding on your outdoor sconce fixture you need to make two very important decisions. First, you need to decide what of the three common styles will best match your house. The three categories are tradition outdoor sconces, modern outdoor sconces, and rustic outdoor sconces. Second, you need to decide between three types of glass. Your choices for outdoor sconce fixture glass are opaque, translucent, and transparent. Traditional outdoor sconce light fixtures have a few things in common. First, they all have the same general shape. They all look like the top of a lighthouse. There is typically a spire at the very top that resembles the top of a tower and then a case that surrounds the area where the light bulb is. The cage can be anywhere from four sides to six. The sides of this cage area are typically made of glass and that is where you have the choice of opaque, translucent and transparent. Transparent glass is clear and you have an unobstructed view of the light bulb inside. Translucent glass is still clear enough that you can see inside, but it is often slightly cloudy or beveled so that the light bulb inside is not clearly visible. Opaque glass is completely solid so that you cannot see inside, but it is white or whitish so that the light still filters through to a certain extent. However, the light from an opaque glass sconce is softer. Modern or contemporary outdoor light fixtures in the sconce style do not have the spire at the top like the traditional outdoor sconces. 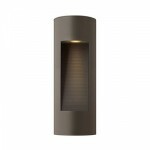 Instead, modern outdoor sconces will have more simple geometric shapes like rectangles or cylinders. Another difference is that with traditional sconces, the light bulb is central to the design but with modern sconces, the light is often hidden behind the decorative light fixture. The light will shine into the middle of the light fixture or be in a back light style rather than shining a bright light bulb onto the porch or doorway it is designed to light. Like opaque sconces, the light will be softer. 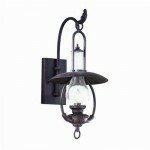 Rustic outdoor sconces are a very particular type of traditional outdoor sconce. Some things that separate rustic sconces from other traditional sconces is that they often are hanging light fixtures rather than ones attached to the sides of a house. They hang like an old fashioned lantern. While they do use light bulbs, they are designed to look like they are lit with candles. Another thing that sets these outdoor light fixtures apart is the materials used. Rustic outdoor light fixtures are usually rod iron or bronze so that they look like authentic metal light fixtures rather than plastic or artificial looking. 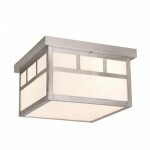 The next most popular kind of outdoor light fixture is an outdoor ceiling light fixture. These light fixtures are similar to the light fixtures you will find in almost any room inside your home. They are attached to the ceiling where there is a hole for the electrical cords. The plate that is attached to the ceiling has a socket for the light bulb and then there is a separate piece that attached to the ceiling plate to cover the light bulb. Depending n the style of the cover, the light fixture will shed bright or soft light on the area below. There are four types of outdoor light fixtures for the ceiling including traditional light fixtures, modern light fixtures, and mission style light fixtures. The main difference between traditional outdoor ceiling light fixtures and modern ones is that the traditional light fixtures will have a cover made of glass that allows a good deal of light through in no specific direction. Modern light fixtures have softer light and often the light bulb is shielded or placed such that the light shines in one particular direction. In addition, the tradition ceiling light fixture will have a familiar circular or geometric cover shape while modern ceiling light fixtures will be shaped differently than we are used to seeing. Mission style ceiling light fixtures are more traditional in style but they are unique. Mission ceiling light fixtures are almost always square in shape. They have glass sides that are usually opaque. The four sides are outlined by a metal pieces and there are additional metal pieces that divide each of the four sides in half horizontally. Then, on the top half of each side, they are further divided by pieces into three smaller panes. In the end, there are a total of 17 panes including the bottom of the light fixture. In general, outdoor ceiling light fixtures will shed more light than outdoor sconce light fixtures because the light comes from above and will shed light on a greater area than wall mounted light fixtures. If you have a large porch rather than just an entry way or threshold, then this is the variety of outdoor light fixture for your home. A slight variation on the ceiling light fixtures discussed above is pendant light fixtures. Pendant light fixtures are also hung from the ceiling, but rather than a plate attached to the ceiling, there is a chain that a light fixtures hangs from. The hole for the electrical cords is much smaller and usually runs down the chain to the pendant light fixture. Because they are attached to the home with a chain, there is much more room for style and variation. The shapes and adaptations you will find with pendant light fixtures are many. Just like other light fixtures you can have different types of glass and different finishes including copper, bronze, and black. 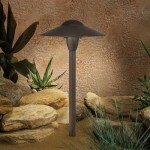 Outdoor post light fixtures are specifically designed to be mounted on top of an outdoor post. They provide light for any outdoor area where you can install the post. Most people use them at the end of a driveway or beginning of the walkway up to their door. There are two subcategories within this category of outdoor light fixtures and they include post lights and pier mounted light fixtures. Pier mounted light fixtures look very similar to post light fixtures, but they are designed to be installed on top of a wall or decorative stone marker rather than a post. 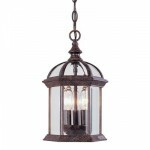 Within the post light fixture category, your styles vary depending on the finish of the light fixture. Common finished include black, copper, bronze, rust, and iron. The materials of construction will be sturdy materials like aluminum, acrylic, brass, and glass that can withstand the elements since they will be unprotected by an entrance way or porch. Some post lights will use a light bulb and will need to be wired to an electrical source in your home. The wires should be buried so that there are no tripping hazards. An alternative could be a solar post light fixture. If the post light fixture has a small solar collecting panel on the top, you could power a battery to charge an LED rather than use a light bulb. The light from solar lights will be softer, but will save energy costs and eliminate possible safety risks with wires. It is extremely important that you purchase a post or pier mount that will fit the light fixture you have chosen. They are usually not sold as a set; rather you need to buy the two pieces separately. Therefore, check to make sure that the sizes and styles match each other. In most circumstances, the post and the light fixture should be from the same manufacturer, but they do not necessarily have to be. Something that can add value and aesthetic improvement to your home is outdoor landscape and pathway light fixtures. They are mostly for decorative purposes, but they can provide lighting if you tend to have frequent visitors walking up to your front door. Pathway lighting usually consists of light fixtures on sticks that you stick into the ground. They usually look like mini lanterns. They only shed light for a few feet so you will find light on both sides of the path every six feet or so. Because there are so many of them, it is quite common to use decorative solar lighting for your outdoor light fixtures in order to avoid numerous cords. Cords can be tripping hazards and they can be damaged when they are buried. Solar light fixtures have solar collecting panels that absorb sunlight which charges batteries which in turn power LEDs. Because they use solar power, you do not have to contend with cords or light bulbs. LEDs last longer than the light fixtures themselves in most cases, so the only thing you have to replace is the occasional battery. In addition to pathway lighting, there are other landscape light fixtures that are common in large yards. Submerged light fixtures that shine spots on trees and other landscape features are another option. They are usually buried in the ground so that they cannot be seen by people observing the home. Other spot lights might be mounted on the house or on trees to accent garden areas or certain areas of your yard like a pond or plant grouping. There are also lights specifically made for ponds that float on the surface. Pond light fixtures are usually sphere shaped with a heavy weight attached to the bottom so that they stay upright with the weighted part under the water. Garden light fixtures are another option. Typically, garden light fixtures are disguised to look like something else. Some common disguises are rocks, small animals like frogs or rabbits, or insects. 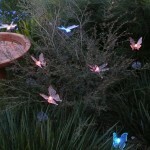 The solar garden lights that look like insects or butterflies are usually on top of long thin wires that stick into the ground. The wires are sturdy enough to hold up the small solar light fixtures, but thin enough to remain invisible to the eye at night. If you have a deck or outdoor patio in your yard, then you will want to make sure that you can use that outdoor space during all hours. That is why outdoor deck lighting is so important. 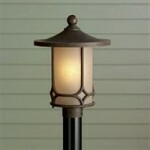 There are several different kinds of deck light fixtures to choose from. First, you can use a smaller version on pier mounted light fixtures on the corners of the deck. The corner pieces are usually a little larger than the rest of the railing pieces, and you can fit a small pier mounted light fixture there. The other rungs in your deck railing can house deck rail light fixtures. These small helmet style light fixtures stick to the railing much like a sconce light fixture, only smaller. You will need many of these small lights in order to shed enough light for the entire deck space, though, so some other kind of outdoor light fixtures may be needed for your deck. If your deck or patio area has a roof or canopy cove, then you can use hanging lights overhead along the edges. These lights are often seen at outdoor restaurants and bars and they create a festive atmosphere for entertaining. These lights will be on an electrical cord much like Christmas lights are, so you will need an electrical outlet. The other deck light fixtures we have discussed work best if they are solar light fixtures because you do not need to worry about cords and they can charge all day out in the sunlight. You only need a few hours of sunlight a day in order for the lights to work. The downside to solar light fixtures is that they will turn on every night even if you do not need them. If your need to light a patio area that does not have a railing for deck rail fixtures or pier mounted fixtures, then you might consider outdoor table lamps and floor lamps. The only difference between these outdoor light fixtures and the traditional lamps you find indoors is the materials of construction used. Because you will be using these light fixtures outdoors, they need to be able to stand up to the elements. That is why they are constructed of weather friendly materials like aluminum, glass, plastic, and Sunbrella fabrics. In addition to wear and tear, you also need to be concerned about safety. Using electric light fixtures outdoor can be dangerous in the rain or moist conditions. That is why solar light fixtures are ideal. Security lighting is important to many homeowners so that they can keep unwanted visitors away and so that they have sufficient lighting for themselves when they are entering and exiting their home. 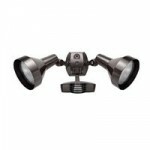 Outdoor security light fixtures are most often secured at the roof line and are of the flood light style. Most homeowners or security companies install them over or near entrances and exits. The other common feature is that they are motion activated. When anything moves close to your home, the bright flood lights will turn on. The sudden bright light will scare away intruders or animals. When you drive up or leave your house, the light will be helpful for you to get to and from your car without falling, for example. Because they need to be bright, many outdoor security light fixtures or flood light fixtures are electric because light bulbs are brighter than LEDs. However, there are solar flood light fixtures on the market. These light fixtures for security contain many LEDs rather than just a few. The large number of LEDs can shed enough light for an effective security light fixture. Since there are several light emitting devices, you need a large solar collecting panel for the batteries. This is not a problem with security outdoor light fixtures because they are mounted at the roof line and you can install the solar collecting panel on the roof.